With Happy Insights you can ensure your team is getting the relevant reporting and data by sharing your dashboards ad-hoc, or setting up a regular scheduled cadence. You can also export the data, to keep a backup for your own records. From here you will select your Scheduling and Formatting Options. From here you will select your Sharing Options. Happy Insights offers flexibility in how you would like to share and present your data to your team. Exactly what it says on the tin! Give a name to your dashboards so you can keep track of which Reports are being sent to your team. We recommend using strong descriptive names, especially if you’ll be scheduling quite a few Reports. You can choose how you data is shared with your team. 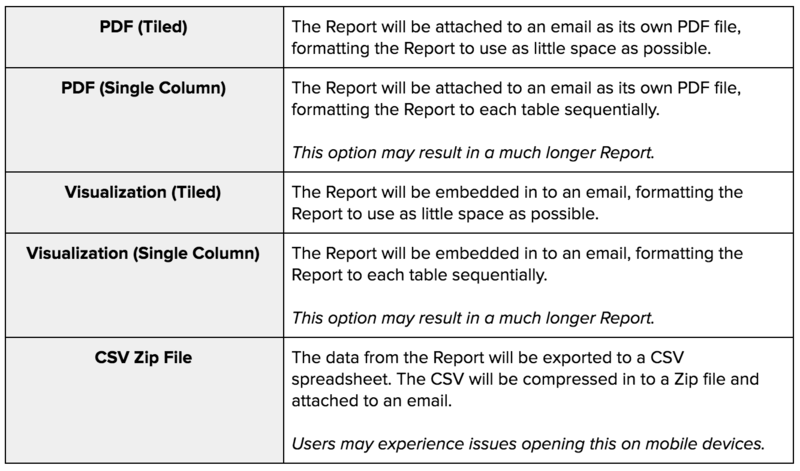 Email will send the Reports directly to their inbox, or if you can have your IT managers upload them directly to your servers using the Amazon S3 and SFTP options. Share the Report with as many Users as you’d like. Simply enter the name in the ‘Add Recipients’ field, then click Add. You may find that you have a long list of Email addresses to add to the schedule. For this, save time by adding multiple email addresses at the same time by separating each email by a comma, then clicking Add. When scheduling a Report, you will have the option to choose the frequency as well as the exact day and time the Report will be sent. This can be adjusted at a later date, if you find you need more or less regular reporting.